FONDA — The Fonda-Fultonville Central School District architecture team earned another state championship at the Olympics of the Visual Arts. For members Ty Sanges and Joey Susi, this was their fourth state championship. Team members Tristan Cline, Matheau Dettenrider and Isabella Miller continued to move the team forward in accomplishment. FFCS was also represented by the fashion and painting teams at the 36th Annual Olympic of the Visual Arts on April 25 at the Saratoga Springs City Center. Students worked hard for several months to problem-solve and create their entries as a team. More than 900 students participated. 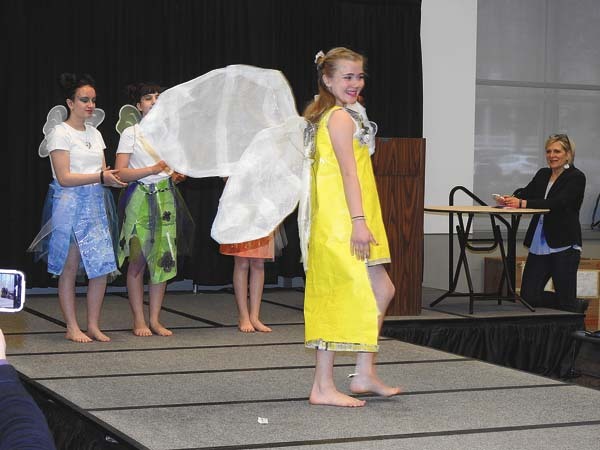 The fashion team created original fashions around the theme “things with wings.” The painting team created artwork that reflected a “steampunk” theme, and the architecture team designed a labyrinth. During the competition, the painting and architecture teams worked to solve a spontaneous activity, while the fashion team modeled their fashions. Schools from across the state were present as well. The painting team is represented by Scout Huckans, Emily Griffin, Gabby Rourke and Jordan Chatwin. The fashion team is represented by Regan Hesch, Rachael McNeil, Sabrina Swartz, Elizabeth Magi-Townsend and Gianna DiNatale.